Earlier this week, the Treasury surprised the market and sent bond yields higher, when it unexpectedly reported that in the current quarter, US funding needs would increase by $56 billion to a $329 billion, and in the second half of the year will be the most since the financial crisis a decade ago, with the Treasury expecting to issue $769 billion in net marketable debt in the second half, the most since the financial crisis. Here the surprise is that whereas consensus had expected 5-year auctions to increase by $1 billion in the quarter, the Treasury will now increase the auction amount by $1bn every month in the quarter, for a total of $3BN, which in turn will put extra pressure on the belly. Specifically, the Treasury will sell $34 billion in three-year notes on Aug. 7, compared with $33 billion it sold last month and $31 billion in May. 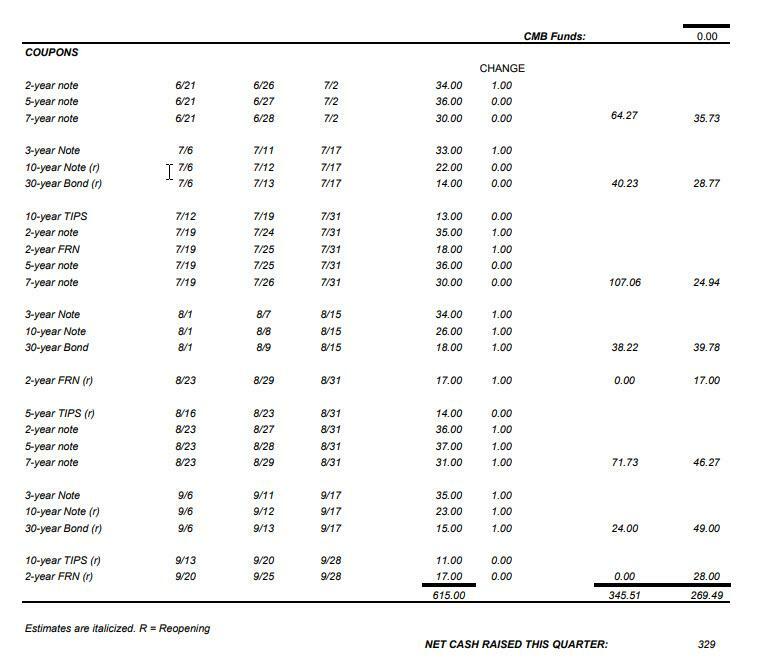 The 10-year note auction will be increased to 26 billion on Aug. 8, from $25 billion last quarter, and sell $18 billion in 30-year bonds on Aug. 9, up from $17 billion in May. The sales will raise new cash of $39.8 billion, according to Bloomberg. The Treasury again left unchanged the size of TIPS auctions, and said it is studying whether to introduce a second new five-year TIPS to its auction calendar. Furthermore, having previously disclosed plans to sell 2-Month Bills, today the Treasury unveiled plans to begin selling 2-month bills on October 15, and will settle on Tuesdays unlike the traditional bill settlement day of Thursday. In order to enhance the liquidity of the new 2-month tenor, Treasury is also announcing changes to the 1-month bill auction cycle beginning in November. After a period of transition, 1-month bill will be a reopening of the 2-month and will also settle on Tuesdays. The TBAC also recommended new bill issuance be kept at “a quarter to a third of new issuance over the intermediate term." Given seasonal patterns, “bill supply is anticipated to gradually increase,” Treasury said. “This increased bill supply will include the launch of the new benchmark 2-month bill in October.” Treasury said it will meet any unexpected change in financing needs with increased bill sales. TBAC also discussed commercial bank demand for high quality liquid assets (HQLA) and the role Treasuries are likely to play in portfolios in the context of the Fed’s balance sheet normalization.